To describe Yekaterinburg in one word would be controversial. It is a city of industrial glory with well-known factories and a cultural, educational and scientific center that at the same time bears a dark fame as the site where the last Emperor of Russia was killed and a place where the mafia was in control in the 1990s. 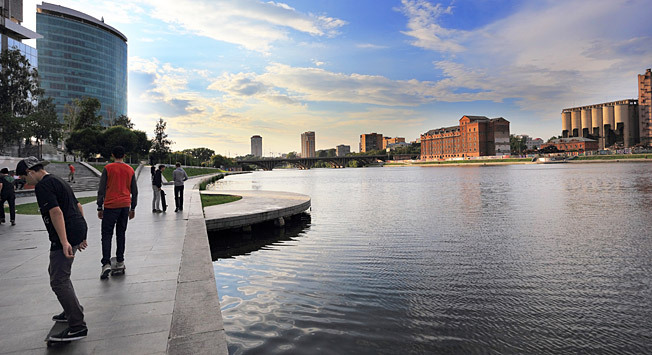 Yekaterinburg seems to absorb and transform in a way each and every epoch of its history. It appears as a surprising mixture of architectural styles that range from provincial art nouveau historical buildings to constructivist architecture and modern skyscrapers. Just a few meters away from each other stand orthodox churches, Soviet monuments and modern shopping centers. Yekaterinburg is a city that can conquer one’s heart just as it has forever conquered ours and not just because it is our hometown. It’s because you never stop discovering new aspects of its everyday life and history. It's built on the site of Ipatiyev house where the last Emperor of Russia Nicolas II and his family were killed in 1918. It bothers us that regardless of all other great things such as unique architecture, gem stones, industry, science and culture, Yekaterinburg is known primarily because of this sad historic event. This church peculiarly stands on the side of Ascension Hill, which is crowned by the graceful sky-blue Church of the Ascension of Christ - so you can see the two together. Right in front of the Church of the Ascension there is a monument to the Ural Komsomol (youth division of Communist party) - seems ironic for such a monument to be surrounded by two churches since communists were against religion. Continuing down the hill past provincial art-nouveau style wooden houses you'll finally arrive at the embankment to enjoy the view on modern government buildings, the Drama Theater, Hyatt hotel and the newly built Iset skyscraper. Our first choice would be the Yekaterinburg Museum of Fine Arts. First of all you can find fine examples of cast iron molding and especially the Kasli Cast Iron Pavilion presented at the 1900 World Expo in Paris. The museum also has a collection of jewelry with precious stones and gems from nearby mountains. The collection of paintings is also worth a look. We personally like the temporary exhibitions of Yekaterinburg painters - in a way it is like discovering a city’s soul and seeing if your feelings are the same or not. One of the features that define the Urals and Yekaterinburg is the availability of natural resources and this fact has always played a great role in history of our city. The region is especially known for malachite – malachite powder was used to paint roofs in order to protect them from humidity. Since there was a lot of malachite, why not? The construction of the metro was supposedly financed by natural resources. They say that the first stations construction costs were paid off a year before the first metro train was put into operation due to the discovery of precious stones. Our city is worth special attention simply as a city. Only in Yekaterinburg do full blocks built in the constructivist style still remain. Our city is an open-air museum of constructivism. The overall image of the city has something perpetually unfinished about it. Vladimir Mayakovsky in his poem devoted to Yekaterinburg in 1928 described the transformation of provincial Yekaterinburg into "metropolitan" Sverdlovsk (the city’s Soviet-era name) as if a big city was being born. This process has never finished. Where else can you find a city as an endless beginning? In different districts you get the sense that one has raised a foot but has never put it down to finish the step and the foot is still in the air. If you visit Yekaterinburg go to the top of the Vysotsky skyscraper. From the viewing platform you will be surprised by how compact our city is (most compact city in Russia with a population of more than one million), learn some anecdotes from our city life, and then go down, walk the streets and feel the rhythm of the city. It is a good idea to visit neighboring towns such as Nevyansk and Sinyachikha for their unique architecture and history. Nevertheless sometimes you just need a quiet and peaceful day off and Yekaterinburg is surrounded by forests, so it’s not hard to find a place for a relaxing walk. The Ural Mountains in this area look more like great hills covered with woods but there are several ski resorts and in summer it is possible to go for a picnic at Devil's Town (Chertovo Gorodische) or Gronsky rocks – rocky parts of the mountains – popular among Yekaterinburg residents. Hackberry pie, Ural fish pie cooked with lots of tiny fish or radish ravioli. Seems a bit weird but nevertheless they are very tasty. They are hard to find in cafes and are mostly known by the older generations. Are there any well-known people from your city's history? Pavel Bazhov was a writer and wrote tales based on Ural folklore (Sergei Prokofiev, a famous Russian composer, created a ballet based on one of these tales). Alexander Popov is from here and is acclaimed as the inventor of the radio. We understand that these names are not well known outside of Russia. Nevertheless one name that will instantly generate some interest is Boris Yeltsin. The first president of the Russian Federation studied in Yekaterinburg and started his political career here. As it’s a city of controversy, isn’t it a good place to be the hometown for such a controversially perceived political figure? Has your city ever been the backdrop of a creative work? The Russian remake of American TV series “Married…with Children” represents a family living in Yekaterinburg. The series became so popular that a monument to the main character – Gena Bukin – can be found on one of the city’s central pedestrian streets. And right behind that there’s a monument to Michael Jackson… Haven’t I already mention the controversial nature of our city?